This image layout reveals how the appearance of the North America nebula can change dramatically using different combinations of visible and infrared observations. The North America Nebula (NGC 7000 or Caldwell 20) is an emission nebula in the constellation Cygnus, close to Deneb (the tail of the swan and its brightest star). The remarkable shape of the nebula resembles that of the continent of North America, complete with a prominent Gulf of Mexico. It is sometimes incorrectly called the "North American Nebula". 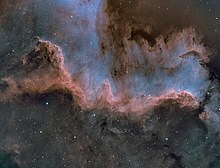 The portion of the nebula resembling Mexico and Central America is known as the Cygnus Wall. This region exhibits the most concentrated star formation. The North America Nebula and the nearby Pelican Nebula (IC 5070) are parts of the same interstellar cloud of ionized hydrogen (H II region). Between the Earth and the nebula complex lies a band of interstellar dust that absorbs the light of stars and nebulae behind it, and thereby determines the shape as we see it. The distance of the nebula complex is not precisely known, nor is the star responsible for ionizing the hydrogen so that it emits light. If the star inducing the ionization is Deneb, as some sources say, the nebula complex would be about 1,800 light-years' distance, and its absolute size (6° apparent diameter on the sky) would be 100 light-years. The nebula was discovered by William Herschel, from Slough, England, on October 24, 1786 or by his son John Herschel before 1833. ^ a b "NASA/IPAC Extragalactic Database". Results for NGC 7000. Retrieved 2006-10-17. ^ Shevchenko, V. S.; Grankin, K. N.; Nel'Nikov, S. Yu. (1988). "The structure of RSF 4 CYG B - Regions of star formation from an unusual point of view". Astronomicheskii Zhurnal. 65: Nov.–Dec. 1988, p. 1230–1243. In Russian. Bibcode:1988AZh....65.1230S. ISSN 0004-6299. ^ "New View of Family Life in the North American Nebula". NASA. Retrieved 23 February 2012. ^ "NGC 7000 – North America Nebula". SEDS – Students for the Exploration and Development of Space, The Messier Catalogs. Retrieved 25 August 2017. This page was last edited on 26 February 2019, at 23:02 (UTC).